This article explains how to properly install Product Customizer (premium tier) into a shop using the Parallax theme. In order to properly change the way option pricing is shown to customers, several modifications to different templates are necessary. Before you begin your installation, please ensure you've disabled the "drawer" / fancy style cart in this theme. Go to "Customize theme", then under "Cart Page", change "Cart type" to "Page". The drawer cart is incompatible with option pricing (read more here). There are two steps to modifying the Parallax product template. 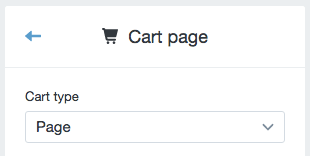 To find your cart template, go to the "Sections" folder in your theme. Click on Sections > cart-template.liquid to edit this file. We'll need to make several modifications to the cart template to support displaying options along with modifying price display. To find your "product thumbnail" template, go to the "Snippets" folder in your theme. Click on Snippets > product-thumbnail.liquid to edit this file. We'll change two lines of code to skip the product quick view for customized products, as this does not support option pricing.